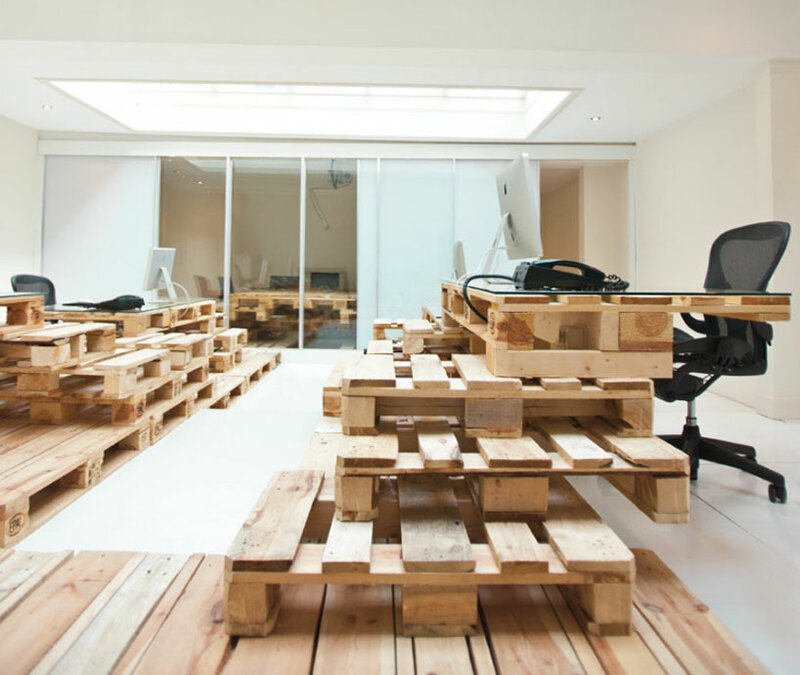 pallets are typically used for shipping goods and generally not appealing. however, their structural foundation has made them a popular material choice which has seen them being repurposed into furniture, housing structures and retail interior displays. most architecture were commissioned by amsterdam company brandbase to design a temporary space for their new office location. because of its impermanence, the client proposed a low-budget renovation, in which most architecture decided to employ 270 shipping pallets to shape and inform the workplace. 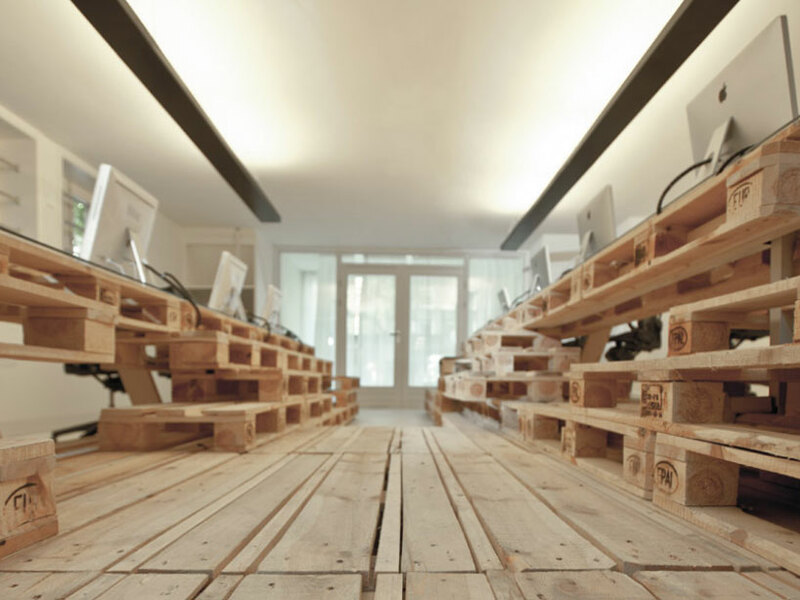 the open concept suits the advertising agency’s collaborative approach, whereby long workstations made from stacked pallets create a casual work environment, which occupies a typical dutch canal house–a structure that stands tall and narrow–that is 27 meters deep, with a back area divided by a split level. the interior has been painted completely white, providing a homogeneous base for the pallet structures. outside of forming the furniture, the employed low-cost material is used architecturally to build the staircases. I think this is just ugly. It looks awfully cramped. Pity those who have to be there every day. A very attractive yet highly flammable office. 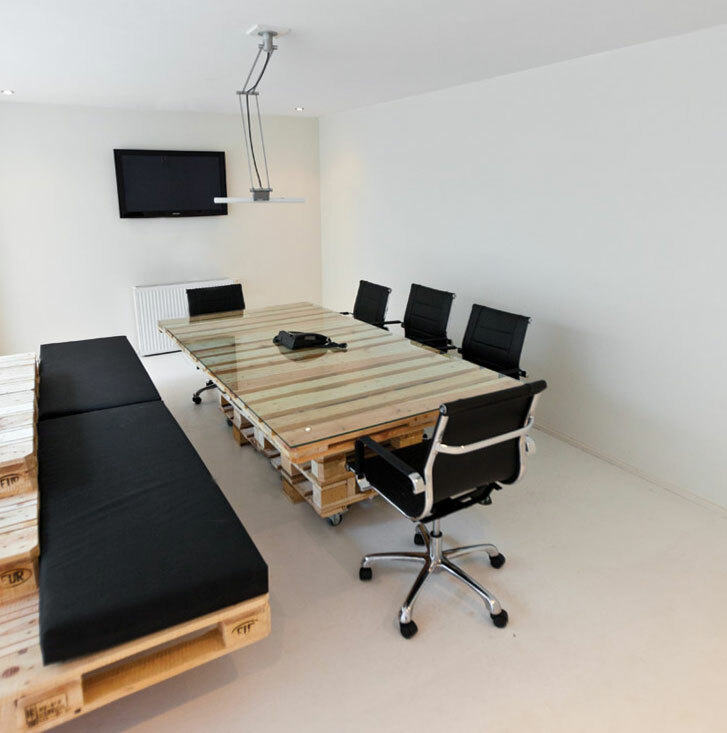 The board room is the most successful space I think but why create furniture and space only by stacking the pallets? Interesting design concept taken to the extreme…. were there any other iterations? The concept is cool, yet the architect did not designed this office structually. This is a typical example of ”look only – do not touch” architecture. Offices generate dust, and lots of it! those pallet stacks are ideal for storing dust particles. Who the hell will clean this thing??? ANd i hope those pallets are treated with water and fireproof coating! I love th concept of the office. May i say ‘out of the box’. Pity, very few people subscribe to such overtures in design and fewer still will agree from the maintenance point of view. 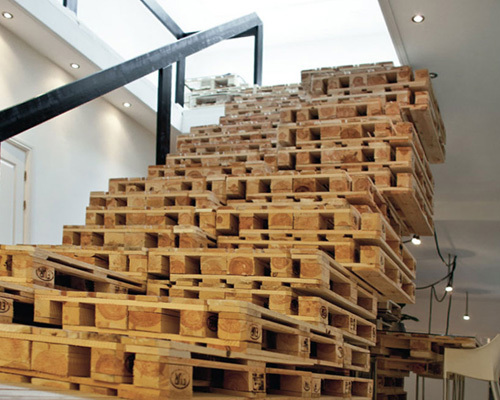 I would have liked it if they had used real pallets and not designed and used their own. Using real ones would make it a larger and more interesting design challenge. I don’t think it can be truly considered recycled if you build your own. Love the design and its concept! Are Dutch pallets constructed differently than American ones? I’ve met many a pallet in my life, and every one was full of nails and other bits of metal, treated with cyanide, and constructed using the cheapest quality of wood possible. So were these ‘pallets’ special order or do the Dutch just have more ‘pride’ in their disposable materials that they use a higher grade construction? 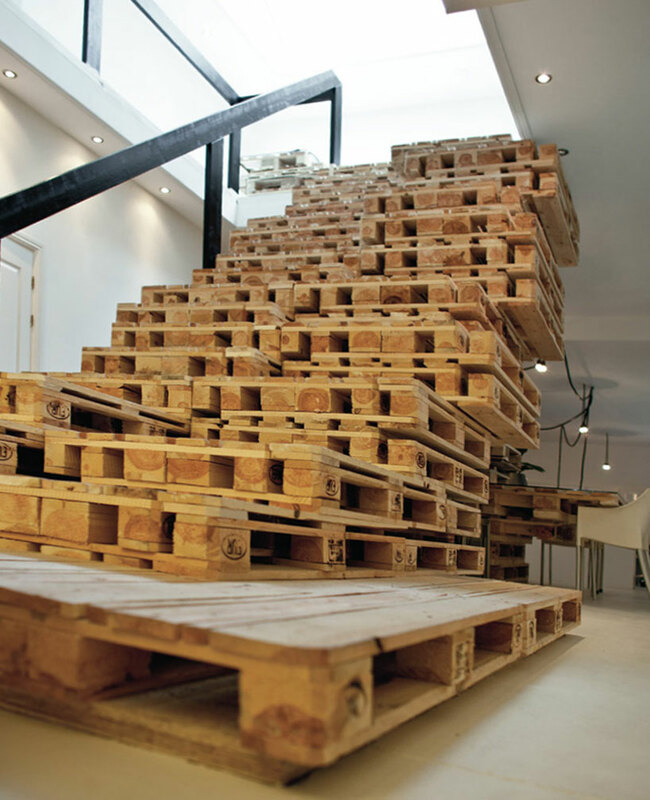 europallets are standardized, and were promoted heavily from the German logistics world, and now in widespread use in Western Europe. They are sturdier than generic and single-use pallets, in fact pools exist where a standard fee is levied in exchange for a pallet delivery. Where do these guys leave their paper? Now that I have looked at the pictures on a normal monitor (instead of on a mobile`s screen) I see that it is a mix of Euro-pallets and custom made pallets that do bear a Euro-logo but that are clearly a notch above normal pallets in their finishing and plank layout. @Sahin destroyed this work. Good idea, bad realization. Imho, he is damn right. Useless. @pallet expert: you have a keen eye on the pallets. Its indeed a mix of europallets and half europallets (which are recomposed of whole ones). We chose to sand all pallets to prevent people getting injured by splinters. That’s why the color of the pallets is more even than usually the case is with used pallets. For the desks we made some on site modifications, took out the blocks and replaced the bottom planks. @Ivan: the images might suggest that the structure cant be used. Think we should have made some of the working days..that would have given a better understanding of its use.. its real fun to see the people freely sit on the pallets and work on their laptops..
i can see for what they were aiming – but i can also see that they completely missed.